Enno Hallek is trying to explain "Portable Sunsets"
Enno Hallek, who works in Stockholm, is one of the most outstanding Swedish artists hailing from Estonia, having made a considerable contribution to the development of Scandinavian Pop Art and Conceptualism. 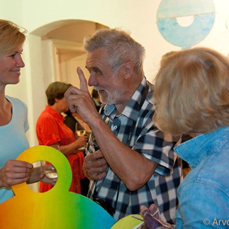 He has also been an active participant in the Estonian art scene abroad. As part of his fourth solo exhibition in Tallinn (earlier shows were in 1990, 1995 and 1999), Hallek is exhibiting 1m x 1m circular plywood module paintings or "fraktals" hanging on the walls, from the ceiling and on movable clothing store stands. According to the theory of fractals, the same structures repeat in different enlargements and endless copies, without losing their initial meaning. Hallek has always been intrigued by all manner of theories and in addition to the fractal theory, he is also particularly captivated by the string theory, which attempts to explain how the universe is constructed of the tiniest particles, which carry information like a vibrating string, but which no one has seen with the naked eye. Hallek's main mission is to deal with the question of how to visualise what we cannot see, or in other words to paint theory. Using the principles of lego, recycling and experimentation, the development of his system of shapes, which began in 1990, lies in the endless combinations of fractals, the permanent positioning of components of works, re-painting and the impending dismantling of recently created symmetrical or ideal compositions in order to combine new, unsymmetrical configurations. Yet even a knight and a flea – the heros of Hallek's humourous video of the same name (1999) – are fractal creatures due to the technology of their armour and similarity of their external shells. While Hallek was initially intrigued by the construction of systems, a new level of narration has now been added to the systems: every work tells its own story (read the titles). Hallek is a painter par excellence and a magnificent colourist. Rainbows and sunsets are recurring motifs featured in Hallek's work. These are reflections of brightly coloured natural phenomena witnessed as a child on the coast of Läänemaa, which he combines with the most varied colour combinations. I believe in this case Enno Hallek is cultivating something originating from Kandinsky: the endless analysis of the specific psychological and physical characteristics of each colour, as well as the cultivation of his own personal education of colour. But this is so he himself can learn, not teach others. Hallek's goal is to create non-typical colour perception and pictorial associations. Since Hallek's installations change from exhibition to exhibition, then practically no work remains unchanged (in its initial form) and only a photograph can capture the memory of a work in its certain combination. The democratic aspect and portableness behind the creative mechanics of Hallek's works also express a very conceptual approach – the opportunity for the public to have a part in the development of various combinations and the portability of the works, which creates new meanings, depending on the environment. If someone's creations make one think seriously and also create a good mood, then there must be something extraordinary in the nature of the art.